Bengaluru-based online grocery startup Bigbasket has raised $5 Mn (INR 32.65 Cr) from Helion Ventures Partners. This comes at a time when rival Grofers India has pumped in $14.7 Mn (INR 96 Cr) from its Singapore-based parent company Grofers International. As per the RoC filings by Supermarket Grocery and Supplies, which runs Bigbasket, the investment took place on September 27 and involved the allocation of 50,000 shares at INR $100 (INR 6,509.25) apiece. Just over a fortnight later, the online grocery startup secured $839 K(INR 5.5 Cr) from its existing investor, Trifecta Capital in debt funding. Since starting operations in 2011, Bigbasket has been backed by a bevy of investors, including Brand Capital, Bessemer Venture Partners, Ascent Capital, GrowthStory, Paytm Mall, Alibaba Group and Abraaj Group, among others. Grofers, on the other hand, calls Tiger Global Management, Sequoia Capital, SoftBank Group and Cyriac Roeding as its chief investors. According to the company’s recent filings with the Ministry of Corporate Affairs dated September 19, the grocery startup issued 269 shares at $18,187 (INR 11.84 Lakh) apiece and 542 shares at $18,164 (INR 11.83 Lakh) apiece to Grofers International. Started by Fabmall founders VS Sudhakar, Hari Menon, VS Ramesh, Vipul Parekh, and Abhinay Choudhari in 2011, Bigbasket has to date raised about $310.8 Mn spread across seven rounds. Bigbasket’s online grocery stores are present in more than 26 cities across India, including in Bengaluru, Hyderabad, Mumbai, Pune, Chennai, Delhi, etc. According to the company, the online grocery store stocks over 20,000 products and 1,000 brands including fresh fruits and vegetables, packaged bread, bakery and dairy products, etc. The company claimed to have crossed the 5 Mn customers mark in May 2017. This year, Bigbasket has been in the news for being the in talks with many players for a stake sale or acquisition. In June, multiple reports had surfaced regarding Amazon having preliminary talks with the Bengaluru-based online grocery startup Bigbasket, for a possible acquisition. However, the online grocery startup refuted the news of talks with Amazon for an acquisition. Similarly, in July 2017, it was reported that Paytm Mall was in talks with Bigbasket to invest $200 Mn for a substantial stake. At that time it was reported that Paytm had also started due diligence of Bigbasket accounts and operations. Later Chinese ecommerce joint Alibaba was also said to have joined the discussions. In August, the startup received the government’s nod on its investment proposal for FDI in food retail. Gurugram-headquartered Grofers, on the other hand, was founded in 2013 by IIT graduates Albinder Dhindsa and Saurabh Kumar. The company has raised close to $180.2 Mn funding till date. It currently offers products across categories like grocery, fruits & vegetables, beauty & wellness, household care, baby care, pet care, bakery and meats & seafood. At present, the startup has delivery service operations in 25 cities including Agra, Ahmedabad, Bengaluru, Bhopal, Bhubaneswar, Chandigarh, Chennai, Delhi, Gurugram, Hyderabad among others. In July this year, Grofers received the final approval from the DIPP for food retail, around the same time that Amazon got the green light for a $500 Mn investment. At the time, it was reported that the company was looking to bring an additional capital of $40 Mn to expand its business and grow the market. 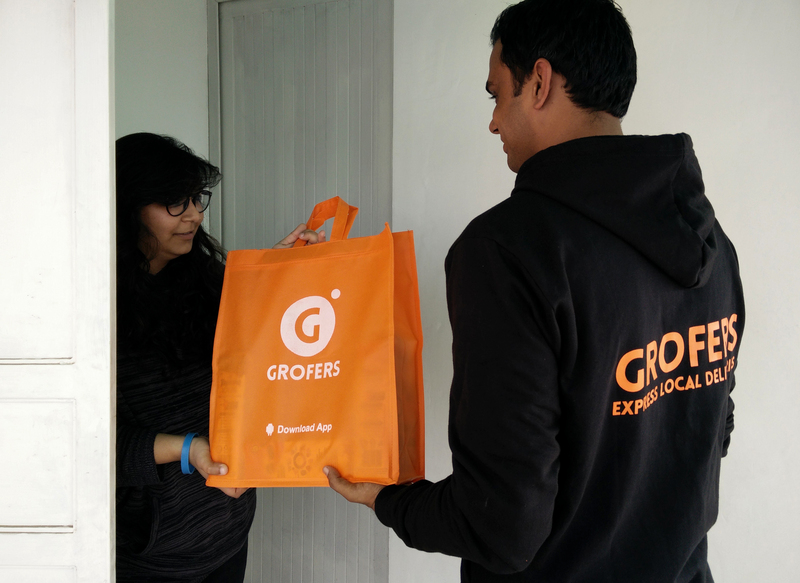 In April this year, Grofers also reportedly set up 15 offline stores across Delhi/NCR. According to sources, the company opened two types of offline stores i.e. tuck shops and franchise stores. The startup also initiated tie-ups with startups in the city such as OYO to open tuck shops (small shops selling tea and snacks) in their premises. Earlier in February, it entered into a pan-India partnership with Reliance Fresh. And in December last year, it partnered with YES Bank to allow Grofers customers to get currency notes delivered to their doorstep along with their grocery order for up to $30.7 9 (INR 2,000) through YES Bank PoS machines in the aftermath of demonetisation. As per a Goldman Sachs report, “The domestic online retail industry is evolving into a hyperlocal, on-demand market. India’s ecommerce market is estimated to grow 15 times to $300 Bn by 2030.” The Indian online grocery market is estimated to reach $40 Mn (INR 270 Cr) by FY ’19 growing at a CAGR of 62% from 2016 to 2022. The space is also attracting major traction from the country’s leading ecommerce players such as Paytm, Flipkart, and Amazon. Other startups in the online grocery sector include ZopNow, Satvacart, Godrej Nature’s Basket and DailyNinja, among others. In March 2017, US-based multinational retailing corporation Walmart announced its plans to open nearly half of 50 new stores in Uttar Pradesh (UP) and Uttarakhand over the next three-to-four years. Later in July, Indian unicorn Flipkart launched the pilot of its on-demand grocery delivery service in in Bengaluru. Flipkart’s first foray into the space was with Nearby in October 2015. However, it was later shut down in February 2016. Most recently, in September, the Tata Group announced plans to enter into online grocery business under Starquik brand. Tata Group currently operates in offline grocery under the Star banner — Daily, Market and Hyper. The pilot venture of the online grocery platform is scheduled for rollout by November. In June, it was reported that group was in also talks to acquire Gurugram-based on-demand grocery delivery platform GrocerMax. The latest fundings in Grofers and Bigbasket come at a time when the country’s online grocery market is brimming with potential. Whether the newly-raised capital will help these startups thwart competition or make them more susceptible to consolidation is something that only time will tell.